At the turn of the millennium, the global community devised a strategy for development with clear and measurable targets in the form of the Millennium Development Goals (MDGs). In 2015 a set of Sustainable Development Goals (SDGs) replaced the Millennium Development Goals. From the outset, it was recognised that the realization of these ambitious objectives would greatly depend on renewed and deepened partnerships at national and international levels, and significant increase in the resource allocation for developmental initiatives. 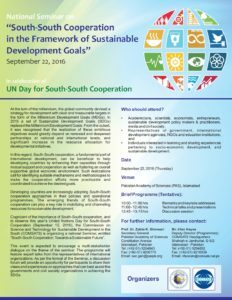 In this regard, South-South cooperation, a fundamental part of international development, can be beneficial to help developing countries by enhancing their capacities through mutual support and cooperation as well as fostering an overall supportive global economic environment. Such realizations call for identifying suitable mechanisms and methodologies to make the cooperation efforts more practicable and coordinated to achieve the desired goals. Developing countries are increasingly adopting South-South cooperation approaches in their policies and operational programmes. The emerging trends of South-South cooperation can play a key role in mobilizing and channeling resources for sustainable development. 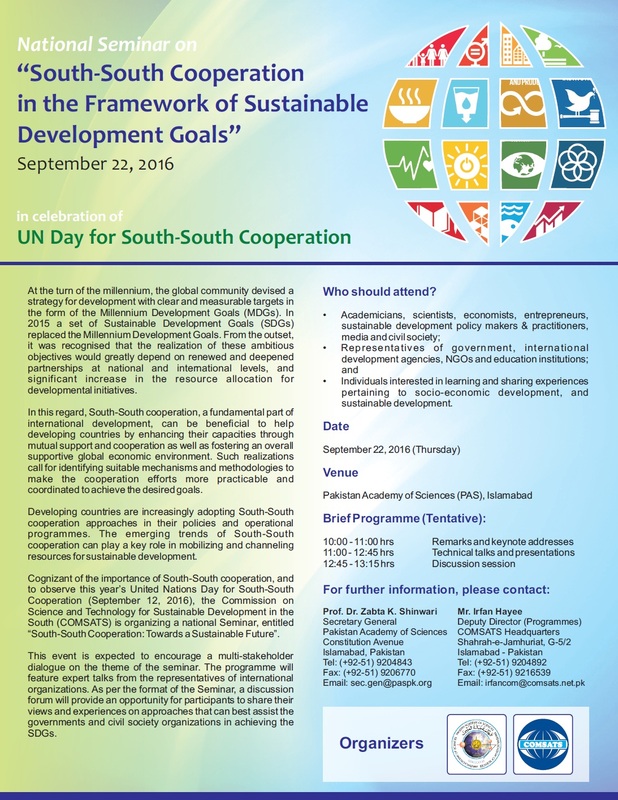 Cognizant of the importance of South-South cooperation, and to observe this year’s United Nations Day for South-South Cooperation (September 12, 2016), the Commission on Science and Technology for Sustainable Development in the South (COMSATS) and Pakistan Academy of Sciences are organizing a national Seminar, entitled “South-South Cooperation: Towards a Sustainable Future”.